Corporate Transportation Solutions in Dubai are becoming a big problem since most of the bigger companies and event organizers are worried that don't find viable transportation companies. We are here to help you, we are one of the leading Bus Rental Companies in Dubai, providing full solutions to our customers who can choose between 12 - 55 Seaters. We Proud ourselves with a Young Fleet of Luxurious Buses, Minibuses and Minivans, which will give you safety and swift trip. Our Experienced drivers will guarantee calm and security on the roads and they are perfectly able to act correctly in any unexpected situations. 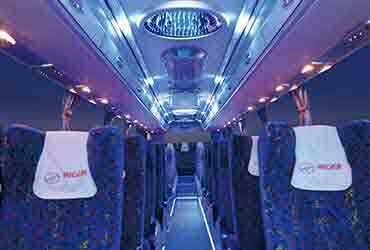 The vehicles are equipped with toilets, climate control, audio and video equipment, Wi-Fi. You will surely enjoy a nice clean interior, tinted windows and ergonomic seats. Our corporate services will be suitable also for Weddings, Parties or other special events. Limousines can be arranged as well, fully-decorated with comfortable seating so your beautiful new journey starts perfect. We are taking care of all your needs so that you will be able to remember the ultimate luxury of our cars and services. If you are trying to arrange a Private Bachelor or Birthday Party we will take care of your ride and for sure offer you the best options at the most reasonable packages. Ride in Comfort and Luxury while our drivers will ensure you get a stress-free experience and you will be in a safety environment at all times. Our company will provide you the best School Buses in Dubai which will give your kids a safe ride all within a Reasonable Pricing Our name is our quality and we are always working to enhance the things which no other can do. Reach safe your Destination. Easy online inquiry.